A wing-mounted generator emits particles of silver iodide for the Western Kansas Weather Modification program Aug. 28, 2007, near Lakin, Kan. Some solutions to climate change and drought are more, well, science fiction-y than others. Take cloud seeding, the science of manipulating clouds to dump more snow and water. CPR listener Paula Yunker of Edwards was curious if the technology was actually real, and if it was, how cloud seeding worked and if there were any environmental downsides. Yunker posed her question through CPR’s Colorado Wonders project. Cloud seeding is indeed real, and thanks in part to recent research from CU Boulder’s Katja Friedrich, scientists know more about it than ever. When mountains push air up into the atmosphere, it condenses into “tiny cloud droplets,” as Friedrich describes them. Most of the time, those droplets are too small to fall back to the ground as precipitation. Cloud seeding mixes silver iodide into clouds to turn those droplets into ice crystals, and then into snow. “So the idea is again to turn something that would otherwise just hover in the atmosphere into snow,” Friedrich said. Studies have shown that the amount of silver iodide left behind by cloud-seeded snowfalls is too small to have an affect on people, plants or animals. Getting silver iodide into those clouds is the very foundation of cloud seeding, but it’s the trickiest and most expensive part of the process. Scientists have to find the right kind of moisture-rich clouds and launch the silver iodide at an ideal temperature: between 17 and 25 degrees Fahrenheit. Part of Friedrich’s research has focused on figuring out the best way to release the silver iodide — distributing the substance from above the clouds by aircraft is more effective, but igniting the silver iodide flares from the ground is cheaper. Power companies, ski resorts and governments have all funded various cloud seeding efforts. Cloud seeding has existed for decades, and has significant traction in other western states such as Idaho and Wyoming. Colorado has only recently joined the cloud seeding game as the state’s snowpack has declined and the Colorado River runs dry. While cloud seeding is successful, Friedrich believes there needs to be more than one technology at play to negate the affects of climate change. 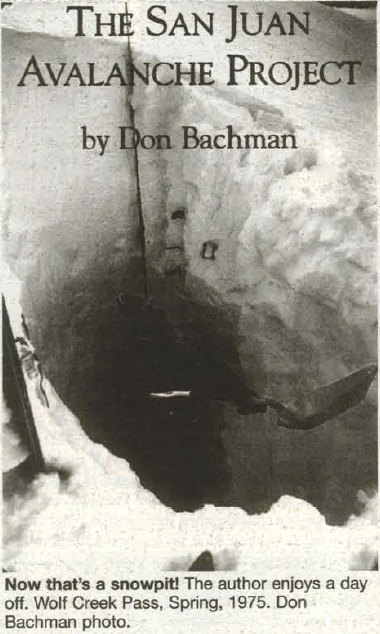 In early May of 1971, I was detailed to Silverton by the Institute of Arctic and Alpine Research (INSTAAR),University of Colorado with a purchase order and instructions to locate a house of suitable size to base an office and living quarters for an avalanche research project.